Terrorist designation follows deadly bombing of police station Tuesday. 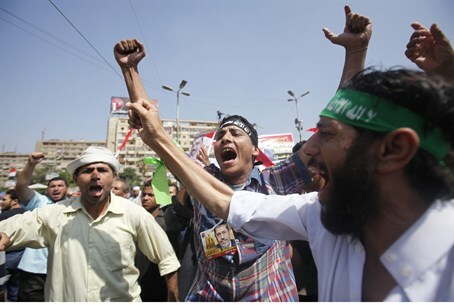 The Egyptian government has designated the Muslim Brotherhood as a terrorist organization, one day after a deadly attack on a security building in the city of Mansoura killed 14 people and wounded more than 100 others. "The Cabinet has declared the Muslim Brotherhood group and its organisation as a terrorist organisation," Deputy Prime Minister Hossam Eissa announced on behalf of the Egyptian cabinet Wednesday. Tuesday's attack was claimed by Ansar Bayt al-Maqdis, a Sinai-based Al Qaeda-inspired group. Ansar Bayt al-Maqdis has claimed various attacks in and outside the Sinai peninsula, including the unsuccessful September 5 car bomb against interior minister Mohamed Ibrahim in Cairo. The Salafi group has also claimed responsibility for firing rockets from the Sinai Peninsula at the Israeli resort city of Eilat. Nevertheless, interim Egyptian authorities have long claimed a link between the Brotherhood and the string of bloody attacks which followed the ouster of Muslim Brotherhood president Mohammed Morsi. The former president is currently facing trial along with several other prominent Islamists over an alleged "terrorist plot" which involved Iranian-backed terrorist groups Hamas and Hezbollah. The Muslim Brotherhood is already the subject of a court ban by an Egyptian court, following the military-led ouster of Islamist President Mohammed Morsi in July. The ban on the group accompanied a campaign by security forces to crush the Islamist movement in which hundreds of its members have been killed and thousands arrested. Egypt has also frozen the assets of senior leaders of the movement and has arrested dozens of its members since Morsi’s ouster, including most of its leadership. The terrorist designation will enable Egyptian authorities to crack down even harder on the Brotherhood and its supporters. The Brotherhood, for its part, has denied any connection to terrorism in Egypt. In an email to Al Jazeera, the group stated that "The Muslim Brotherhood considers this act as a direct attack on the unity of the Egyptian people and demands an enquiry forthwith so that the perpetrators of this crime may be brought to justice".